It’s one thing to find energy-saving and renewable energy projects that are worth doing, and quite another to get them implemented. Our EE and RE projects focus on uncovering potential energy savings and net operating savings. We help individuals and organizations move forward with their energy-saving investments, implementing projects accounting for major savings identified by our experts. Transportation: encouraging manufacturers voluntary initiatives on fuel efficiency (Vehicle Efficiency), increase efficiency of federal fleets (Federal Vehicles) and inform the public about alternative fuels (Alternative Fuels). Freight Sustainability Demonstration Program: demonstrating and encouraging the uptake of innovative technologies and efficient best practices within the freight transportation sector. Training and Awareness amongst Freight Operators: increasing fuel efficiency and environmental awareness. 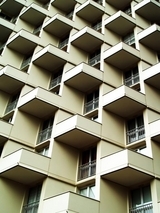 Buildings are large consumers of energy, with large cost components. Companies who do not consider building energy costs are missing significant savings in annual operating costs and opportunities to increase property values. Additional value includes a positive impact to the environment and improvement of employee morale through more comfortable working environment. There are emerging signals that the businesses want to develop more coordinated, forward-looking, and sustainable business strategies to save energy in buildings. Businesses communities, and ecosystems everywhere depend on energy to survive and prosper. Global demand for energy continues to grow, while many energy sources are showing signs of stress. Companies that understand the trends shaping the global business environment will be better positioned to identify new market opportunities, mitigate risk, develop sustainable energy strategies, and create shareholder value. We have developed a portfolio of energy efficiency innovations to help CSOs and CFOs better understand and guide their own organization's relationship to energy efficiency in buildings. Businesses can take advantage of this portfolio of speed-to-market solutions to overcome a variety of financial and operational obstacles which impede the progress. Our experts deliver innovations and resources to quantify solutions and overcome obstacles. We seek to uncover efficiencies in lighting, heating and cooling systems, and computer equipment that will help the host companies to save in net operational costs, cut the kilowatt hours of energy use per year, and avoid greenhouse gas emissions. Companies report that they are implementing solutions representing over 50% of the energy savings recommended by the innovators and experts. Today, energy costs and environmental concerns drive the debate - and demand - for energy reduction in large commercial and public facilities. While it is crucial to build more energy-efficient buildings, new buildings only account for about 2% of the total building stock worldwide. And although focus is placed on design and construction costs for environmentally friendly buildings, 80% of a building's life-cycle cost is on operation and maintenance - with 40% of that cost on energy alone. Therefore, CEC experts can help building owners and operators develop short- and long-term strategies for energy efficiency and sustainability. The need to significantly reduce energy usage in the most ecological and financially efficient way possible. Step 1: First, in order for building and energy management professionals to perform adjustments to building infrastructure, they must understand the building's energy intensity, and how it operates, responds and performs every hour. With a comprehensive approach to efficiency monitoring, an energy monitoring system collects and reports data, which is analyzed by an energy efficiency expert with in-depth know-how in energy consumption and operational strategies. Step 2: After the building operator has gained transparency through the implementation of an energy monitoring and management approach, and benefited from the recommendations of an efficiency expert, it is now time to implement those efficiency recommendations and ensure the building systems continuously operate at peak efficiency. Depending on the efficiency implementations during this phase of life-cycle management, buildings can achieve up to 30% energy efficiency. Step 3: Finally, when buildings and their equipment reach a certain age, it is no longer financially or operationally feasible to continue with repair and maintenance. Once the decision is made to replace or retrofit building equipment, efficiency experts can provide strategies to reduce energy usage depending on the financial criteria (payback requirements) of the building owner. A major building retrofit can achieve anywhere from 20% to 80% energy savings based on the condition of the existing equipment and the energy efficiency of the new technology. With this third step of the life-cycle management process to renew the building infrastructure, we have come full-circle back to step one - since we now have a renovated building, we need to gain transparency to maintain ongoing efficiency and optimized performance. For most buildings, life-cycle management approach is a must when it comes to achieving maximized efficiency. When followed properly, this ongoing efficiency strategy will reduce the ownership costs of a building and allow for the most energy, operational and financial efficiency possible. CEC's Lighting portfolio rolls out new integrated solutions from bulbs to devices ready to be implemented across organizations. These integrated solutions make sure the lights are on only when people need them optimizing savings to the users. The upfront costs tend to be relatively low – zero in the case of de-lamping or switching timer settings – so ROI payback time is short. Lighting projects are pretty straightforward to identify. You can often spot ways to cut lighting costs just by walking through a building or driving through an area, and use a simple light logger. Beyond lighting, our experts are also implementing upgrades to HVAC systems, office equipment, and data centers. Organizations are moving forward with air circulation projects to reduce use of electricity; installing power management software for PCs, occupancy sensor, lighting timers etc. saving them millions in electricity bills annually. Energy efficiency is as much about changing behavior as it is about changing lightbulbs. We will continue to contribute to key projects that integrate energy and environmental data into a range of business decisions. Our experts can deliver web-based decision-support tools to help individuals make SMART decisions related to energy, carbon emissions and capital expenditure. We put the facts about energy use and greenhouse gas emissions into decision-makers’ hands is a powerful way to spotlight the business and environmental benefits of energy efficiency, and move energy-saving projects forward. Despite widespread commitment to energy efficiency, when trying to sell an energy efficiency project within a company, there are two key elements to any successful project: Executive buy-in, and breaking down silos within companies. Significant eco-innovations have occurred in the energy sector but only a small share has been implemented and been scaled up. Higher initial costs are one of the major barriers for eco-innovations. Together with information asymmetries this prevents the market diffusion of eco-innovations. Information asymmetries are based upon the general impression of ‘green and expensive’ versus ‘ brown and cheap’. Recently suggested research on energy efficient products breaking down the costs of eco-innovations into two dimensions, namely initial costs and operating costs. This in order to clarify that a wide range of eco-innovations has a different investment profile, higher initial costs versus lower operating costs. We work with CSOs and CFOs and other executives that feel a moral duty to sustainability. We deliver compelling ROI to make a case for investing in energy efficiency projects. On the policy front, we collaborate with government sources and policy leaders. The major challenge with any energy efficiency project is people from design engineering to IT competency. There is a major clash for people both from design engineering to IT competency. We are seeing the void of people today and continue building collaborative training programs to empower people with actionable knowledge. Broadening the approach to Energy Efficiency to be more transformative in its relationship with businesses and address the deeper and more systemic issues of energy and sustainability. The challenge, according to the leading energy efficiency experts, is to achieve the right balance of short term gains of on energy efficiency with longer term strategic goals of sustainability. The sustainability factors can be overlooked but are critical to a companies efforts for future success. In most businesses, efficiency improvements help cut costs and lead to additional growth, so while a company may be improving its efficiency, its absolute greenhouse gas emissions for example may stay flat or even increase. By only focusing on energy efficiency, there may be unintended consequences and fundamental solutions to the deeper problems will likely be missed. The automotive industry is a prime example, because while internal combustion engines have become more and more efficient, we have seen rapid growth in the automotive industry leading to a further commitment to technologies which may not be sustainable in the long run for car based transportation systems. Clearly, efficiency is not the only key to sustainability, and therefore it is vital to understand the the big picture of mobility, efficiency and sustainability.